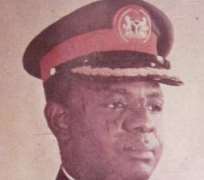 As the family, relations, friends and well wishers of late General Abba Kyari hold his third and seventh day funeral prayers simultaneously today Wednesday in Maiduguri at the residence of late General Abba Kyari located along GRA road Maiduguri near APC State Secretariat amidst mammoth crowd that converged to register their presence at the occasion from far and near. Those in attendance include National Assembly Principal Officers such as Senate President, Dr. Abubakar Bukola Saraki, Senate Leader, Ahned Yerima, Speaker, senators and state governors from the north east led by Governor' Kashim Shettima,. Others include members of the house of representatives, former military governors, senior and retired military officers, notable politicians, serving and former senators, Borno State Executive Council member's, Borno State House of Assembly members led by the Speaker, Abdulkarim Lawan and Borno Elders Forum led by the Chairman, Ambassador Usman Gaji Galtimari among many others. Prayers were administered by Chief Imams from various places led by the Imam Idaini of Borno organized by one of the sons , Senator Abu Kyari , a serving senator and Chairman, Senate Committee on Defence. He condoled with the government and people of Kaduna, Katsina and Borno states over the demise of the elder statesman. The president, however, prayed to God to grant fortitude to the family and friends he left behind to bear the loss. The Nigerian Voice recalls that President Muhammadu Buhari had weekend extended his condolences over the passing of the former military governor of the defunct north central state, retired Nigerian Army Brigadier General Abba Kyari. President Buhari’s condolence message was contained in a statement issued Sunday by his Senior Special Assistant on Media and Publicity, Malam Garba Shehu, in Abuja. The president also condoled with the government and people of Kaduna, Katsina and Borno states over the demise of the elder statesman.